Nicotinamide adenine dinucleotide (NAD+) is a coenzyme — almost like a vitamin — that reacts with oxygen in the cell’s mitochondria in order to create energy for physical activity, Cardio-respiratory function (breathing), sugar and fat metabolism (digestion) and balanced neurological (brain) functions. NAD enables the transfer of energy from the foods we eat to energy production to fuel all cellular activity including cellular communication. Interestingly, NAD+ also increases a group of proteins called ‘sirtuins’ that are crucial in not only ‘turning off’ genes that accelerate degenerative ageing processes but in actually repairing damaged DNA. NAD+ and Ageless NAD were recently featured in The Sunday Telegraph. As NAD+ levels decline, mitochondrial function is impaired so much so that mitochondrial death ensues. Given that Mitochondria are the ‘powerhouses’ that maintain all normal cellular processes, this mitochondrial depletion (also called NAD Energy Deficiency, or NED) results in many of the physical symptoms of ageing and degenerative processes. These include the development of symptoms of chronic fatigue syndrome, substance abuse, depression, stress, anxiety and various other chronic illnesses. NAD+ BT ( Brain Therapy) works by providing the brain and body with NAD (combined with high dose antioxidants and amino acids that have the potential to reverse NAD+ depletion related dysfunctions). Through an intravenous infusion followed by prescription only NAD supplement boosters, BT+NAD (Brain Therapy plus NAD) has been shown to help the body produce the essential energy component of cells (ATP) and in doing, so protect and repair DNA. DNA repair has the end result of boosting the normal function of the immune system, helping lower cholesterol, blood sugar and thus blood pressure, and as a ‘god-like’ neurotransmitter it can stimulate and normalise the production of dopamine, serotonin, and noradrenaline, thereby improving mood and mental acuity. Research into NAD+ as a potential therapy for age-related degenerative disease's has been led by Australian investigators, the most prominent being the Head of the Australasian Research Institute. Compelling research shows that NAD+ has a unique ability to protect tissues as well as induce DNA repair, and thus potentially increase life span. Studies done in the early 1960s demonstrated the efficacy and safety of IV NAD in detoxifying patients from alcohol, opiates, tranquillisers and stimulants. Current research also indicates that NAD deficiencies may trigger a host of metabolic and degenerative diseases — including obesity, Type II diabetes, chronic traumatic encephalopathy, Alzheimer’s, and Parkinson’s. What could an NAD+ booster supplement or treatment do for my body? Recent scientific discoveries have shown that a more proactive approach could help with disease prevention as opposed to disease treatment. 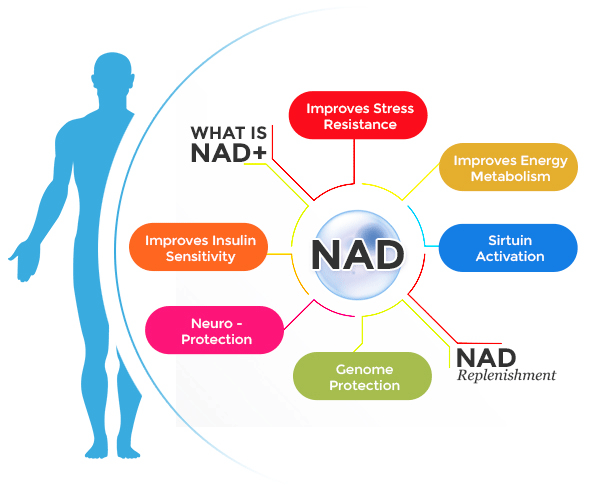 NAD+ treatments and supplements have been shown to repair cellular and DNA damage caused by oxidative stress. This is one of the key drivers for ageing. Therefore as all animals age, our cells are fighting over a dwindling supply of NAD+ this inevitably causes cells to deteriorate and eventually die. 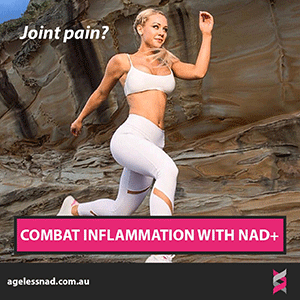 NAD+ can assist in slowing this process and potentially even reversing it. 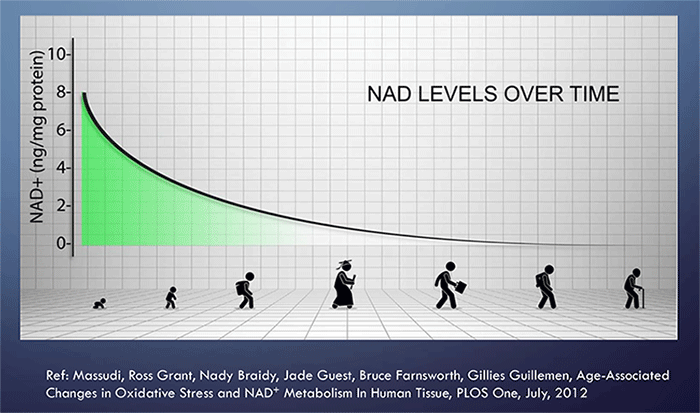 A published scientific paper: “NAD+ Biosynthesis ageing and disease” made the conclusion that bolstering the system by restoring the available NAD+ can mitigate the physiological decline associated with ageing. 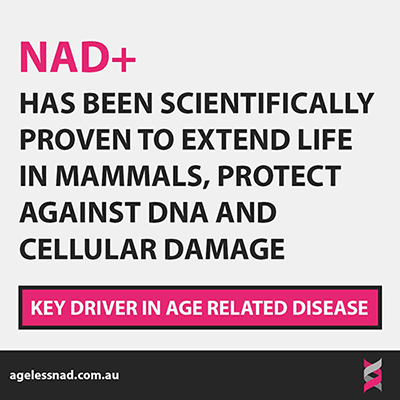 This among a growing number of other scientific papers are concluding that NAD+ can help delay the onset of ageing and even prevent age-related disease. Interestingly there is increasing international pressure to reclassify ageing as a disease. If Ageing is treatable then NAD+ is certainly at the forefront of this movement.